We are so grateful to be able to work with Aaron for our wedding! We approached Aaron late in our planning schedule, and he was nothing but helpful and accommodating to our timeline. It was important to us to have quality and delicious food, but we definitely had a budget to stick to. Aaron was always conscience of our budget, and worked hard to give us options that would work with the budget, but also fit the setting and environment of our wedding. We changed our catering last minute, which could have been a stressful situation for a bride, but Aaron made it so easy and stress-free. We also got SO MANY compliments on the food at our wedding! Other than my dress, of course ;), the food was the aspect of the wedding we got the most feedback about! People were so impressed with the quality of the food, and especially the prime rib. It. Was. DELICIOUS. It was also such a special touch that Aaron and his staff brought my husband a plate of food so we didn't have to go through the line, and actually had time to enjoy our meal. We were overjoyed with our service from ChefauChef and would absolutely recommend them to anyone in need of catering services!!! 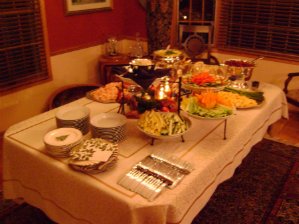 We had Aaron with ChefauChef cater our casual wedding reception of about 125 people, and he was exceptional. We would recommend him to anyone who’s looking for someone to cater their event. Our demands and menu might be described as difficult. We wanted locally-sourced, organically-raised ingredients to create a menu that would fit the requirements of a wide array of different food types: vegetarian, gluten-free, and meat options. Also, we wanted our event to be landfill-free. Aaron took the time to get to know us beforehand and to use his excitement about food to embrace our ideas to create the perfect menu. His menu not only met our unusual requirements, but also expressed our personalities and was absolutely delicious. Countless guests raved over his Asian-spiced burger sliders and his sushi rolls. We had just the right amount of food: no one left hungry and we didn’t have to figure out what to do with gobs of leftovers. Aaron was professional and courteous throughout the entire process. He communicated with us regularly and wasn’t afraid to ask questions. He helped to keep us on task throughout the hectic wedding planning process. He used his experience to make key recommendations to make our event perfect (such as suggesting the right amount of food and the right portion sizes). On the day of the event, he and his staff took care of all of the food-related details so that all we had to do was enjoy our party. His prices were extremely fair, especially considering the level of service and his ability to not only meet our demands but to be excited about them as if they were his own. We’ve had Chef Aaron Young take on the responsibility of cooking for two in-home functions. We hosted a Christmas party for the employees of the bank where my husband works. Fifty guests attended. Aaron successfully catered to a variety of different tastes. He planned and prepared all courses, from appetizers to dessert. Of note were his sushi roll, which was prepared in advance, and his chicken-fried rice. While he cooked at our center kitchen island, the guests enjoyed dinner and were entertained with a flaming Bananas Foster. Aaron served as a “main course chef” for our dinner club. The dinner club members brought dishes to complement Aaron’s “Chicken Cordon Boo”. The theme was “Halloween”, hence, the “Boo” (Aaron’s idea). There was nothing scary about the dish; it was delicious, and, was served by a chef in costume, to go along with our theme. I would recommend ChefauChef for any event without reservation. Price, quality, and delivery were top notch. Thanks, Aaron!